Check out the full list of shows! If you've ever borne witness to an In This Moment concert, you'd probably agree that their live sets are something out of a dream. The polished theatrics, the sprawling stage design, the grandiose ensembles—it all contributes to a sensory experience that you won't find elsewhere in the world of metal. Their fans are just as over-the-top, and have become an integral part of the band's shows thanks to the ever-growing trend calling for attendees to arrive dressed to the nines in costume. 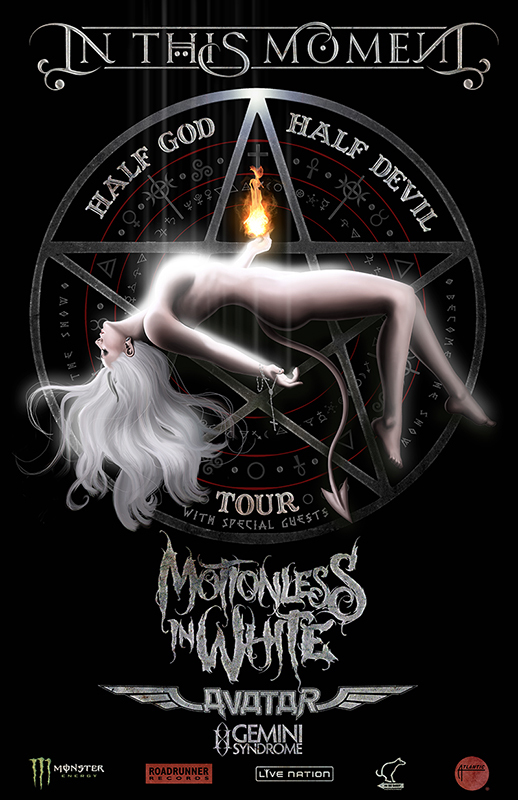 At the center of this dazzling spectacle is frontwoman, Maria Brink, who has taken on the ringleader role for the Los Angeles-based four-piece. Their most recent album, Black Widow, is a testament to this, painting her as a storyteller who masterfully combines elements from rock, alternative metal, and electronic music. Their loyal followers (dubbed The Blood Legion), will have plenty to celebrate today, as the "Sick Like Me" creators have JUST announced that they'll be hitting the road this spring for their month-long, Half God, Half Devil tour. Kicking off in Milwaukee on April 7, the North American run will take them to 19 cities including Omaha, Indianapolis, Toronto, Philly, Baltimore, and Atlanta, before wrapping up in Nashville on May 5. Ahead of their upcoming run, we got to chat with guitarist Chris Howorth about what life is like on the road, how their fans #BecomeTheShow, and what movies the ITM crew are bringing on the bus in between gigs. Check out our exclusive interview below, then make sure to Track the "Big Bad Wolf" musicians so you don't miss them when they're in a city near you! Your most recent release, Black Widow has become such an iconic album for In This Moment. How did the Blood Legion first embrace the material from your major label debut live? Wow thanks! We are actually very fortunate to have the best fans in the world and they usually embrace everything we do, our long time fans know to expect the unexpected from us. We've been a band for over a decade, so we have a lot of songs to pick from when we play live, and certain songs our fans really want to hear. It's usually not an issue adding in a few brand new songs when a new album is released, the fans dig it. Your upcoming tour starts in April in Milwaukee, is there one city or venue that you're most excited to play on this tour? Why? Maria is really excited for her hometown show in Albany and we are just excited for the whole tour in general—we are in a very fortunate place in our career where we are able to play some really beautiful professional venues. It makes touring extra fun when the venues are legit! Costumes, stage design, theatrics are a huge part of your concerts. What is the creative process like for deciding what the onstage aesthetic will be for your shows? Maria is usually at the center of this hurricane directing and planning the whole thing. It starts right when the songs are being written and continues right up to the first show. We are always trying to out do ourselves with our live show and that takes constant planning and working on things. Are there any songs that, when performed live, really benefit from the stage setup? Well, we always try to utilize the stage set up to make every song special in its own way. Maria uses the stage design and props to enhance each song and bring the message or story to life for the crowd. “Becoming the show” is an awesome part of the ITM community because it allows fans to really let go during your shows. What's something unforgettable you've seen a fan bring to, wear, or a do at your concerts? Like I said before our fans are exceptional and they love being involved in the show, they've really embraced the whole "become the show" movement. One of the more unforgettable moments was on ShipRocked Cruise a few years back when a group of fans dressed up as the band, only the girls dressed as the male band members and the guys dressed as Maria and the blood girls. It was insane—like a train wreck, you couldn't look away haha. You’ve said that your fans are a huge part of your band’s inspiration. Can you tell us about one specific instance that might have made it onto a record? One particular instance was at the very beginning of our career, on Ozzfest 2007 we met a kid named Zach, he was in a wheelchair and we ended up giving him a bunch of attention. We didn't think much if it and a year later his mother reached out to us and informed us he had passed away—we were his favorite band and he passed listening to our music. The time we spent with him was so important to him and we didn't realize how much our music had affected him. We ended up dedicating our second album to him, and he inspired the song "Into The Light", we learned a lot from him about what our music means to our fans. 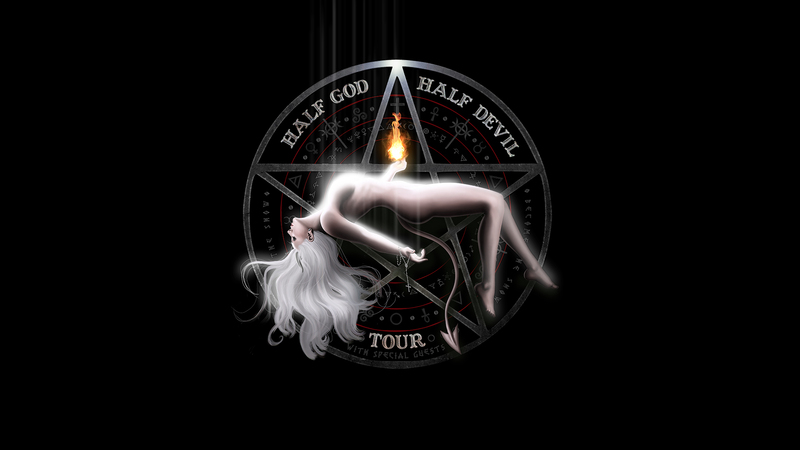 What’s something new that fans can anticipate on the Half God, Half Devil tour? Fans can anticipate a whole new show, from new songs to new choreography for existing songs. We've vowed to make sure every tour we do is updated from the last one. We are putting everything we have into the new show. We all have our little rituals we do before the show. Maria's ritual is intense, it takes 5 hours and covers everything from stretching out and meditation to wardrobe and makeup. The band dudes usually crank up some music and get ready over a couple of hours, and then after the show we all scatter and do our own thing. When you're traveling, what movies are tour bus staples for you all? There is actually a bunch of personal things I like to have on tour with me but one of simplest is my pillow from home. It's a nice reminder of my own bed. You’ve been posting on social media recently about being in the studio. Any clue as when we can expect new ITM material? Yes, its true we have been in the studio for the last four months and we are finishing up (as I write this) the last two songs. We are very excited about this new stuff—our fans are gonna be hearing new music very soon and we are looking at a summer release date. 4/21: Baltimore, Maryland @ Rams Head Live!